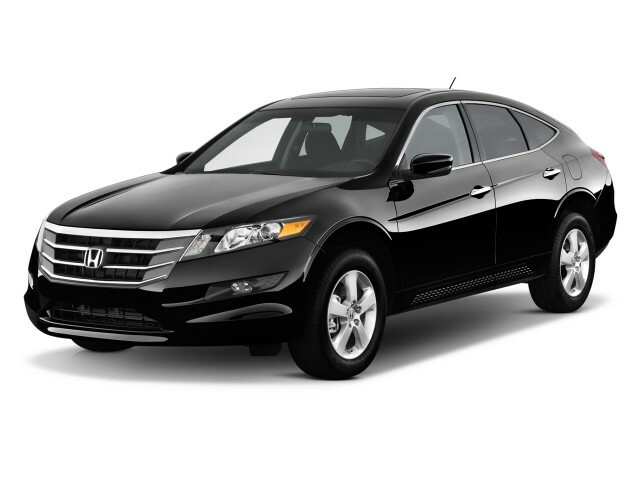 The 2011 Honda Crosstour is a tall, five-door hatchback based on the Accord sedan. While the Accord sedan is bread and butter for the mid-size class, the Accord Crosstour's design, as well as packaging, is quite polarizing, eliciting love-it-or-hate-it reactions. Much like the similarly sized Toyota Venza, the Accord Crosstour is aimed mainly at those who simply want a higher seating position than a car, but a lower one than tall SUVs. Just get in and you'll see the advantage of the design; the Crosstour is very easy to slide into and doesn't require any contorting. It's 7.6 inches higher than the Accord sedan and rides a couple of inches higher—though its six inches of ground clearance are about the same as that of the sedan. The 2011 Crosstour drives somewhat like the Accord sedan but with a heavier, more deliberate feel that's a step in the opposite direction of the nimble feel we've praised the Accord sedan for in the past. The 271-horsepower, 3.5-liter V-6 moves the Crosstour plenty quick, but you're going to feel that weight in stop-and-go traffic. The transmission hesitates to downshift when coming out of a corner, yet it holds lower gears for longer than needed during light acceleration. It steers well and has reasonably good body control on a curvy road, but there's quite a bit more fore-aft motion during hard braking or strong acceleration than we remember from the Accord. Mainly because of its added heft and height, the Accord Crosstour gets significantly lower fuel economy than the Accord Sedan: just 18 mpg city, 27 highway for the front-wheel drive model, 17/25 with AWD. Dual-zone climate control, cruise control, a 360-watt sound system, and a tilt/telescopic steering wheel with audio controls are included in all Crosstours, while the EX-L, as tested at $35,480, included leather upholstery, front heated seats, a HomeLink garage-door opener, and heated mirrors, among many additional features, plus the navigation system with rearview camera system. To find out more of our driving impressions and our overall take on the Accord—plus what more specs, pics, and news, plus what others have to say—read this drive piece on the Honda Accord Crosstour, then browse through our full review of the 2011 Honda Accord lineup.